Looking for something fun to do this holiday season? Whether it is a tree or menorah lighting or a winter festival, here is a guide to some fun, holiday events. Check before heading out, as times and dates are subject to change. Building 77, 141 Flushing Ave.
Info: The future home of the Yard's food manufacturing hub and food hall, Building 77 will host more than 30 Navy Yard tenants and small businesses from surrounding neighborhoods offering a wide range of gifts for the holiday season. Time: 12/2 - 4 p.m.; 12/3 - 12/6 - 6 p.m.; 12/7 - 3:30 p.m.; 12/8 - 7 p.m.; 12/9 - 5:30 p.m.
Time: 4 p.m. – 7 p.m.
Time: 8 p.m.- 10 p.m.
Events around the tree available until Jan. 7. Info: Katz's Deli will be holding a celebration for the first day of Hanukkah, starting with music and other festivities and then giving out free latkes to the first 100 people in line. While the full-on celebration will only be today, they will be giving out latkes to the first 100 in line for the rest of the holiday, once a day. 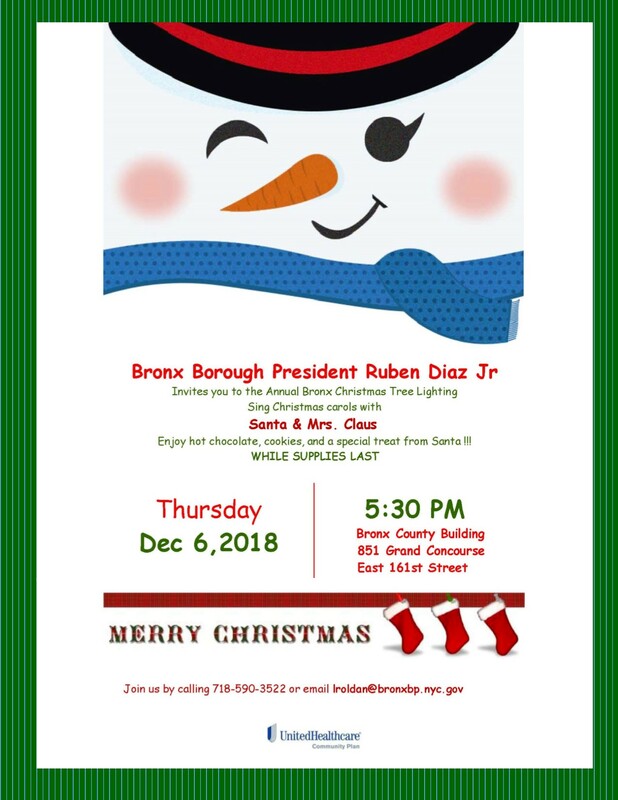 Time: 4:00 p.m. to 5:15 p.m.
Riverdale YM-YWHA, 5625 Arlington Ave.
Friday, Dec. 21, 2018 11:45 a.m.–1 p.m.
Info: Bronx Borough President Ruben Diaz Jr. will host the borough’s annual Bronx Christmas Tree Lighting and holiday celebration. The evening will include Christmas carols, a visit from Santa Claus & Mrs. Claus, as well as delicious holiday treats for the community and youth. Mosholu Parkway Lawn, intersectio of Mosholu Parkway & Bainbridge Avenue. Info: Join family and friends for a four-course dinner with Indian cuisine. Eat, drink and be inspired. Info: Donuts, latkes, signing and dancing. Did we miss an event? Click here and let us know!